Variety is not only the spice of life, but representative of new ISTAR aids that are available for dismounted troops. All equipment that dismounted troops have to carry must more than justify the burden of weight and bulk that it imposes, particularly on reconnaissance troops and special forces who are all too often overloaded with everything they need to live for the duration of a mission in the field along with weapons and ammunition. In addition to desirable performance improvements, new kit that industry offers for dismounted ISTAR applications needs to justify itself with benefits such as the ability to do several jobs well, and this applies to more than just electro-optical devices, more of which later. For convenience, it helps if day and night capable electro-optical/infra-red (EO/IR) devices can be used with one hand or mounted on a weapon without making it unwieldy, so larger devices that require both hands must offer something extra. It is also important that they are frugal in their power consumption to minimise the number of batteries that have to be carried. 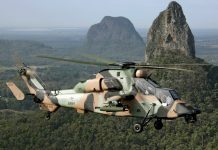 One of the latest offerings is the TiCam 1000B from Thermoteknix, which the company exhibited at the Defence Services Asia (DSA) event in Kuala Lumpur, Malaysia, from 16 to 19 April. 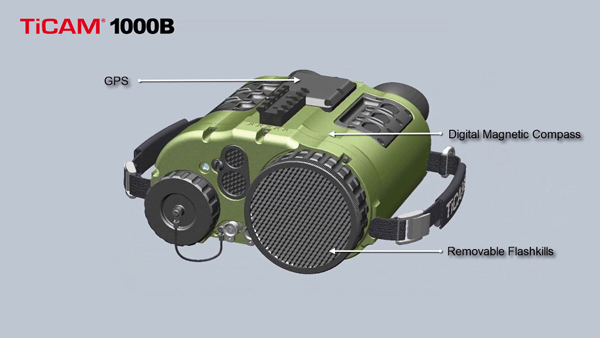 Described as a bi-ocular (one objective lens and two eyepieces) security, surveillance and observation sensor for day and night use, the TiCam 1000B packages a Laser Range Finder (LRF), a laser target marker, a Digital Magnetic Compass (DMC), a GPS receiver and digital recording capability along with the uncooled thermal imaging sensor. The company claims eight hours of operation on a set of eight lithium ion AA batteries, although it can also be plugged into external power sources. It can also be connected to battlefield command information systems to enable real-time data exchange, the company emphasises. Thermoteknix says that the device is suitable for forward observation squads, search and rescue, infantry, border security and special units with varying levels of training. The company quotes a weight of less than 2kg and measurements of 96mm long, 88mm deep and 164mm wide. The infra-red sensor is a 640 x 480 element amorphous silicon array with 17 micron pitch, which is the distance between the centres of the individual detector elements. It operates in the long-wave (8-14 microns) region of the infrared spectrum and can be supplied with different lenses of either 60mm, 75mm or 100mm focal length and with manual focus from 10m to infinity and continuous zoom up to 4x. The lens can optionally be fitted with a removable ‘kill flash’ anti-reflection grid to reduce the risk of sunlight reflections revealing the observers position when using the TiCam 1000B in daylight. Viewed through the eyepieces, the display is a dual OLED device measuring 800 pixels by 600 (800×600) and refreshing at 60Hz. The eye-safe laser range finder operates at 1,550 nanometres in wavelength and offers maximum measurement ranges of 3km against a standard NATO target or up to 5km depending on target and atmospheric conditions, according to the company, while the laser target marker can be specified as a 650nm visible light device or an 850nm device that can be seen by night vision devices. For longer duration observation tasks, it can be mounted on a 2.65kg carbon fibre heavy duty tripod with an integral goniometer. With a folded length of 63.5cm and a minimum deployed height of 38cm, the tripod can be extended to a maximum height of 1.9m with a 24° leg angle. 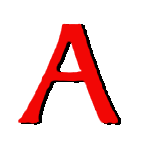 The goniometer is used when very accurate and precise angular measurements of target positions have to be taken, such as azimuth registration. It is made from non-magnetic materials, primarily brass and steel, and features a pointer that locks precisely in the selected position and comes with angle measurement discs with laser etched markings calibrated to 6,000 mils per revolution on one side and 6,400 mils per revolution on the other. 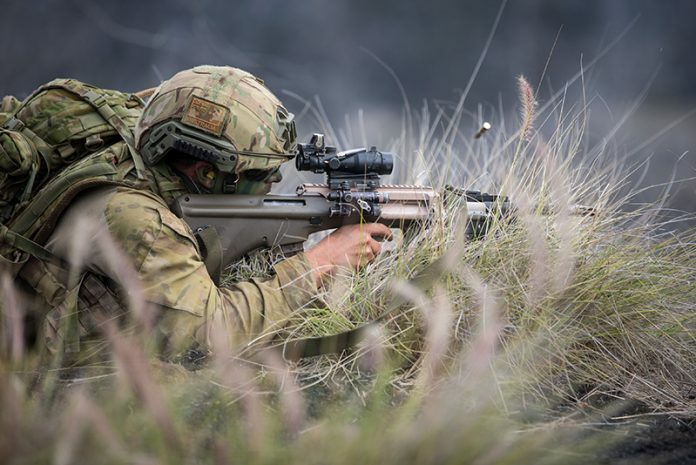 In Australia, the Department of Defence (DoD) is in dialogue with industry through the likes of the Integrated Soldier Systems industry forum. At a meeting of this forum in November, the Armament Systems Program Office laid out the top level requirements for the second tranche of night fighting equipment to be procured under Land 53 Phase 1BR. 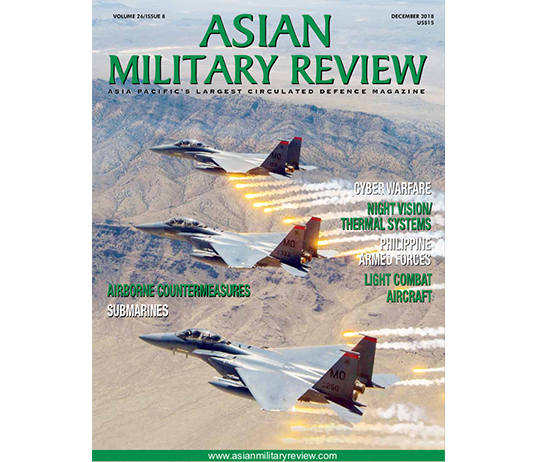 Budgeting around $165 million (AUD $220m), they want the new equipment to enhance or supplement the night vision binoculars and laser aiming devices bought under the first tranche, gaining leverage from emerging technology to provide multi-spectral capability to dismounted combatants, emphasising that the technology use must be mature and capable of being supported in Australia from 2020. 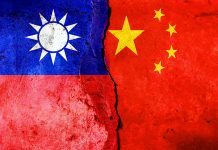 Industry was invited to register their interest by March this year, with a deadline for tenders by October, leading to evaluation and negotiation scheduled to take place between December of next year and May of 2020, when the effort is set to transition into acquisition and service introduction. One company likely to take a keen interest is L-3 Communications, whose Warrior Systems and Oceania divisions is working to deliver a range of first tranche devices ordered under Land 53 Phase 1BR in an award announced in November of 2016, under which deliveries were scheduled between May of last year and May 2021. These include binocular night vision goggles that feature image intensifier tubes with white phosphor screens instead of green ones, a compact multifunction aiming laser with integrated white light capability, and the next generation of lightweight, miniature laser range finders, according to the company. In late December, L3 announced that it had won a contract worth around $150 million from an undisclosed international customer for a number of next-generation devices including its binocular NVG, holographic weapon sights, light weapon thermal sights and advanced target pointer/illuminator aiming lasers to improve dismounted troops’ ability to locate and target operational threats at night and in bad weather. Commenting at the time, L3’s president and chief operating officer Christopher E. Kubasik said that the company “…continues to invest in promising new soldier technologies, such as fusion and augmented reality”. Soldiers given ISTAR related tasks frequently seek a high vantage point for their observations, and increasingly that can be provided by small UAVs. However, Singapore’s ST Kinetic has taken this a step further by integrating armaments. With the unveiling of the company’s armed Stinger UAV concept at the Singapore Airshow, in 2017 the region’s industry is showing that it is as capable as any other of generating innovative concepts for supporting ground troops in need of a very responsive armed ISTAR asset under their own control that can act as a significant force multiplier. Technically an octocopter, the Stinger features four pairs of counter-rotating electrically driven rotors at the ends of four arms that form a cross, under the centre of which is the vehicle’s fuselage pod. Visually and in terms of weight, this is dominated by the 5.56mm Ultimax 100 light machine gun from the same company on a gimbal mount, chosen for its low recoil forces and its ability to accommodate a 100-round drum magazine. Still under development, the complete system is intended to be transported in a support vehicle or carried by a team of three. 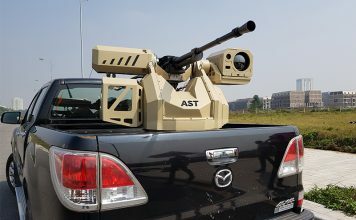 While no details of the Stinger’s key performance parameters such as endurance, speed and range, or of its reconnaissance and targeting sensor package, the company reportedly intends to make the vehicle compatible with its SHielded ADvanced Eyewear System (SHADES) augmented reality display. 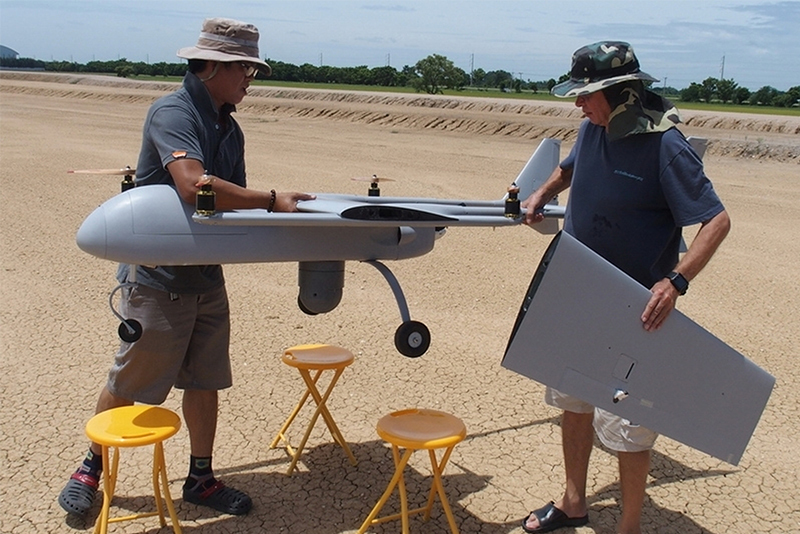 Thailand has also shown innovative small UAV designs, including some that combine vertical take-off and landing capability with the greater speed, range and endurance of fixed wing UAVs from the Top Engineering Corporation. These are capabilities that make such vehicles potentially more practical for small dismounted teams to operate as they can launch from and recover to small spaces automatically and without the need to carry, set up, operate and dismantle any specialised launch and recovery equipment. The UAVs in question are the Falcon V and the smaller Pigeon, both of which feature four vertically mounted propellers for VTOL operation and a single pusher propeller for cruising like a conventional aeroplane. The Falcon V has an 18kg Maximum Take-Off Weight (MTOW) including 5kg of payload and optional wing spans of either 3m or 4.5m, the latter increasing its maximum operating altitude from 3,000m to 5,000m. ISR is at the top of the list of applications for this UAV, and the company offers a sensor suite that includes a high-resolution day/night capable DST OTUS L205 stabilised camera turret with a 200 x IR zoom lens, plus downward looking camera to assist with landings and a forward looking situational awareness camera. However, its modular payload bays can accommodate a variety of other sensor types. The company claims more than six hours of endurance or a range of more than 300km with a cruise speed of between 100-120 knots (185-222km/h), although the communications range with a 900MHz two-way data link that handles command and control (C2), telemetry and sensor video signals is quoted as 50km. The VTOL capability can extend endurance though a perch-and-stare mode in which it can capture full motion video for up to six hours before it needs to recharge its batteries. The Falcon V variant with the greatest endurance is powered by a petrol engine, although electric alternatives are offered, one powered by lithium ion batteries and another by a fuel cell. To complete the system, of course, requires a ground control station that includes a 15-in laptop for mission planning, C2 and UAV data communication, a high-brightness monitor for the video, a video receiver and a data transceiver, a remote control transmitter, a joystick for camera control antennas and an antenna tracking unit. It also requires spare batteries, a battery charger and other items of hardware. This can make UAVs impractical for field use by small units with other tasks, so reducing the overall footprint of these systems is critical. 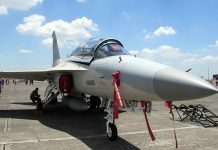 However, the company says its system is modular and adaptable to individual customer requirements, while several leading military communications companies offer means of controlling UAVs and receiving their sensor information through standard military radios. The Falcon V’s smaller sibling might be of more interest to small tactical reconnaissance units. Top Engineering quotes an MTOW of 5kg with 60 minutes of endurance and a C2 range of 20km. Powered by a lithium ion battery pack, Pigeon has a claimed top speed is 43 kts (80km/h), with 27kts (50km/h) cruise and a minimum speed in wing-borne flight of 22kts (40km/h). In ISR operations, the company says it will cover 4.5 km² at once with an illustrative sensor suite of either a 30 MP digital stills camera with 1080p video capability or a dedicated 1080p HD video camera. Pigeon’s small dimensions – a wingspan of 1.8m, a length of 65cm and 16cm in width – and its VTOL capability allow it to operate from very small areas, the company quoting jungle clearings no bigger than 5m x 5m or the deck of a small ship. Ground robots are now firmly established in key military operations including bomb disposal and broader counter-IED and counter-mining, while light tactical vehicles are a staple of special operations and reconnaissance missions. 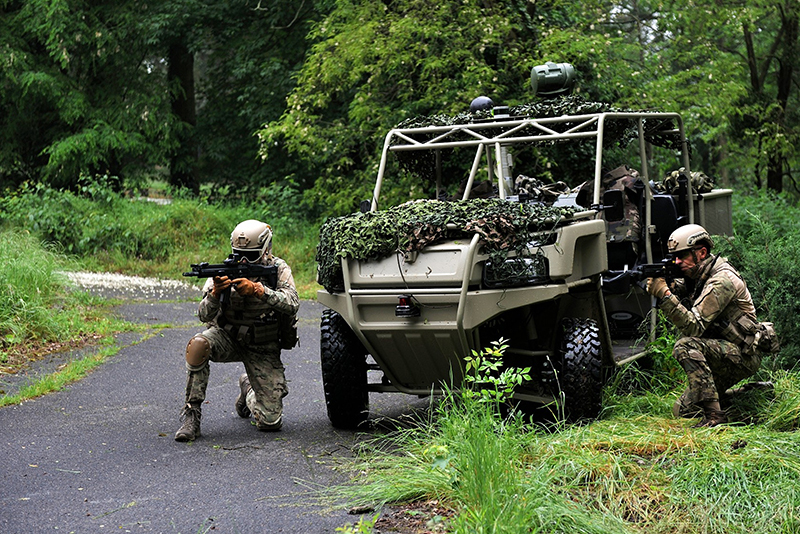 Therefore combining these ideas is an almost inevitable development, and it is one that the French military is pursuing through a science and technology project named Furious, for which defence procurement agency the Direction Générale de l’Armement (DGA) has chosen Safran to lay the groundwork for the integration of robotics into the armed forces under the auspices of the wider Scorpion modernisation programme. Safran employs around 2,500 people in Asia in the aerospace, defence and security sectors, including 500 employees at five manufacturing, engineering and maintenance sites in Singapore, and describes itself as a long-standing partner of the Singaporean armed forces. This five year effort under project Furious will see Safran, chosen as prime contractor for its core expertise in navigation, electro-optics and safety critical electronics, work with research organisations, small and medium enterprises and start-up businesses over five years to develop three robotic ground vehicles of different sizes and mission profiles. Plans call for them to be tested by an infantry platoon in missions such as reconnaissance (including inside buildings) and load carriage. The biggest of these will be the eRider, a vehicle that Safran developed in cooperation with Valeo, a specialist in sensors such as miniature radars and lidars for autonomous cars, and French automotive giant PSA. Unveiled in 2016, eRider is a hybrid diesel-electric all-terrain vehicle capable of carrying four soldiers and their equipment at speeds of up to 70km/h and over a maximum range of 300km. While it can be driven manually, it can also be controlled remotely or operate autonomously according to an uploaded mission plan and with the aid of navigation and collision avoidance sensors. It is also equipped with another suite of sensors to enable it to act as a reconnaissance, situational awareness and targeting asset in addition to its transport capabilities, although eRider’s primary ISTAR assets are the soldiers it carries. Safran has created a vignette to illustrate the vehicles capabilities, in which Special Operations Force (SOF) soldiers are briefed on a desert mission to reconnoitre a village at night in an oasis to watch for signs of terrorist presence or activity ahead of a planned delivery of humanitarian aid. The oasis is about 50km away, so the eRider is driven manually and under diesel power for the first 45km, then switching to electric mode to reduce the vehicle’s thermal and acoustic signatures, navigating with the aid of night vision systems to avoid the use of lights. After getting out of the vehicle, the soldiers make their own way to their individual observation points, leaving the eRider to move autonomously to a programmed location to wait for them while providing overwatch with its thermal, electro-optical and acoustic sensors. The acoustic sensors include a gunfire location system that can cue the electro-optical sensors and send the threat location data and imagery to the team’s devices. Linked to their radios, their smartphone-like devices can be used to command the vehicle to move itself to a better position from which to monitor the threat to they can avoid it, or to come to the team bringing more weapons such as shoulder launched rockets, for example, to engage it. For this, a team member might use a homing request to summon the vehicle and then have it follow that individual. With the mission complete they return to the vehicle, making their immediate egress under electrical power before engaging the diesel engine for the rest of the journey, making their reports to base en route using the eRider’s secure comms system. The combination of new multi-purpose handheld electro-optical devices, hybrid UAVs and smart, optionally manned ground vehicles linked by reliable and secure communications is potentially game changing, and means that the ISTAR capabilities that dismounted troops can exploit need no longer be limited to what they can carry, indeed some of the technology will carry them.